A new season is here! A season to create. A season that enlivens and engages. A season that gives life and animates those things sitting static and still. As you look around you, what is it that needs that little dose of design? Is it the drab entryway you passively drudge through multiple times a day or maybe the partially furnished nursery decorated with unboxed gifts? Cycle through the Spring interior design trends of 2017 below to prep your spirit for a little space pep. by Decorilla designer, Serena Z. When the 80s call, we need to pick up! 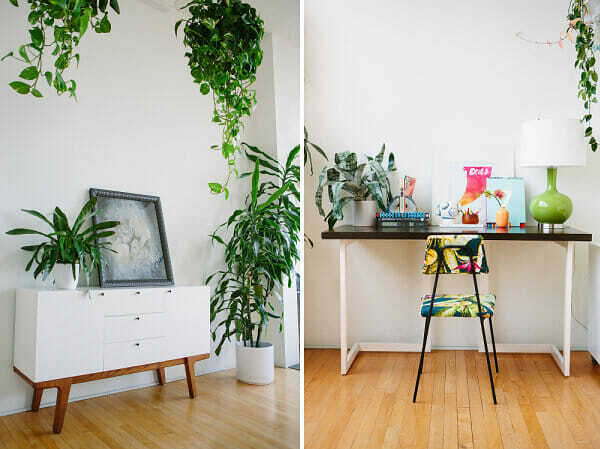 Yes, the Memphis 1980s design movement has been met with a love it or leave it attitude. But, if David Bowie doted over the geometric glamour and primary colors that came with the era, how can we refuse? No need to turn your accent wall into a vinyl album cover though! 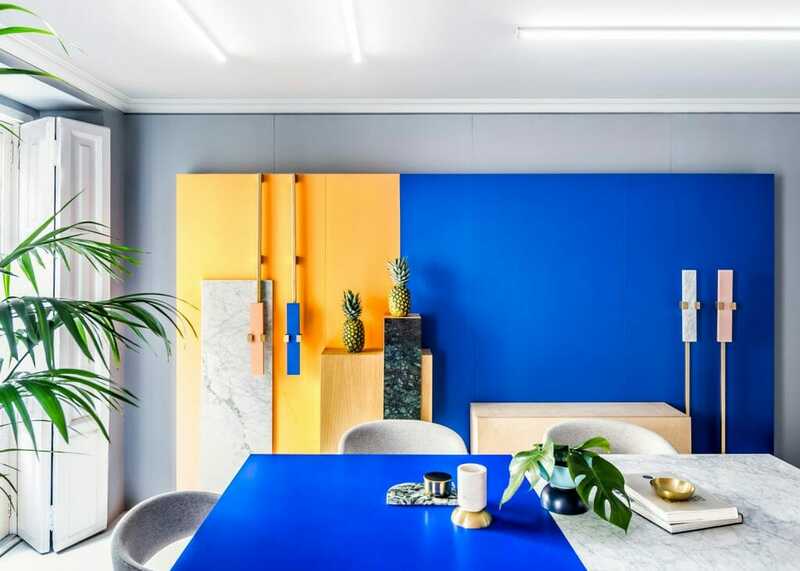 Follow this Spring interior design trend and make a daring little move by adding a bit of bold color or geometric glory to accent pieces and textiles. Worried of regretting a bold 80s choice? Consider a more subdued take on the decade. Drawing from the mixed materials of the Memphis movement, the Shiro Lamp from CB2 strikes a balance with its minimalist Japanese aesthetic. 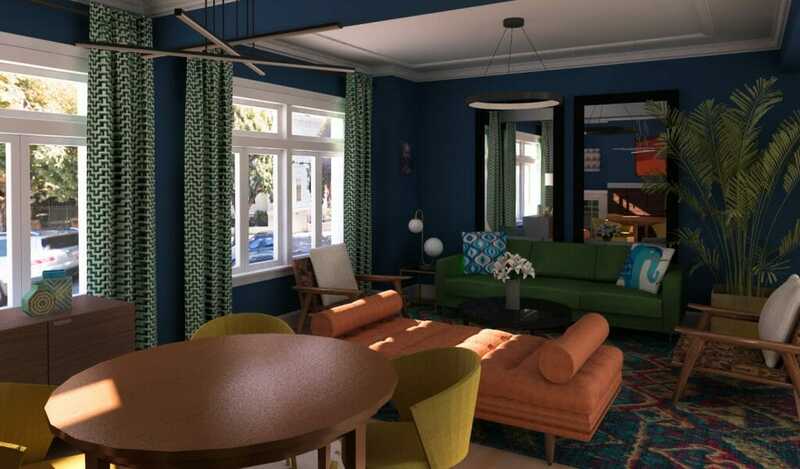 by Decorilla designer, Eleni P.
As an interior design trend itself, Pantone’s Color of the Year (PANTONE 15-0343 TCX Greenery) comes in a vibrant hue of yellow-green. 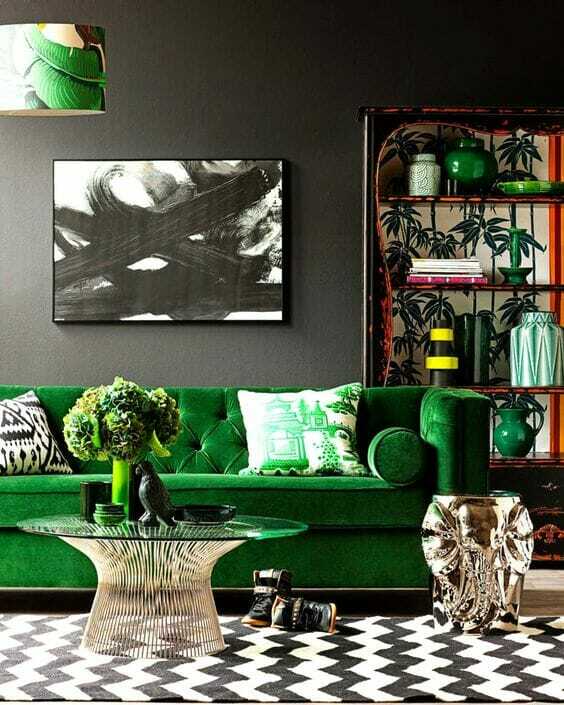 Pigments of foliage are given a right of passage to be elevated from needy little potted plants to the ranks of decadent accent walls, lush velvet sofas, and gleaming Guadi-esque ceramic accent pieces. Mid Century lines come to life when the Owen chair is dressed in the custom Kelly Green fabric at Joybird. It’s a classic, but it trends “sometimes.” Coasting across centuries, bronze makes its debut in 2017 Spring Decorating Trends. Unbiased by surrounding aesthetics, bronze has chameleon charm in the spaces it enters. A myriad of finishes and tones allows the metal to be tailored into a diverse mix of color palettes. 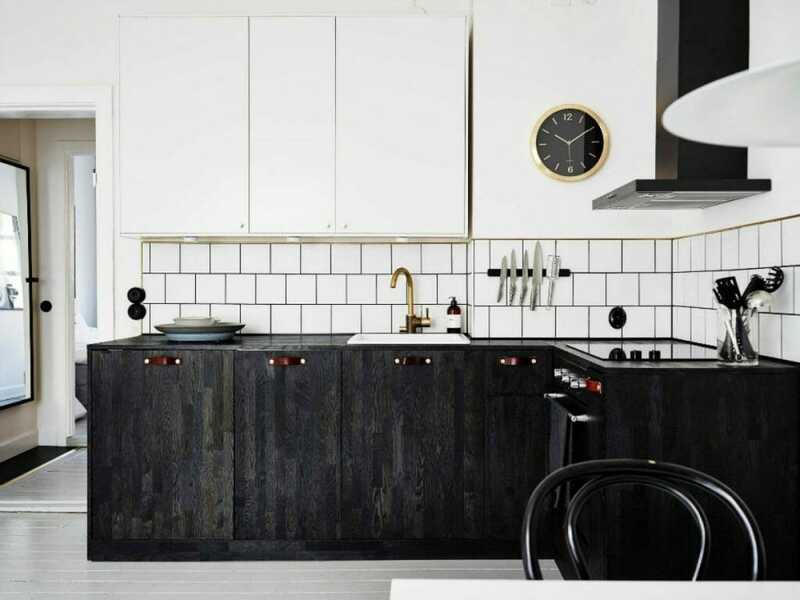 Matte or glass, hammered or polished, thick or thin, its possibilities make it a material that transcends both time and trend. Bronze can bling. The Linnell Lamp by Surya blends vinyl and glass to make a nearly mesmerizing metallic accent piece. Falling from translucent to solids, the lamp brings focus and warmth to any space it calls home. 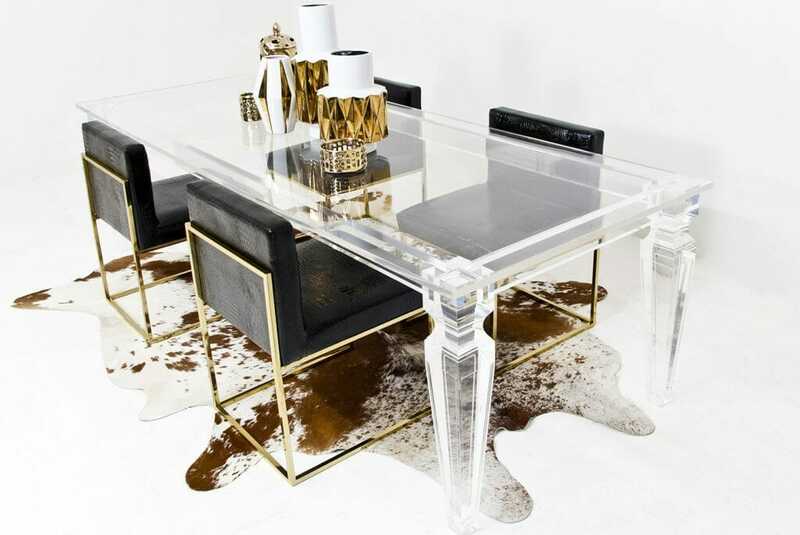 One of the glories of minimal design: Lucite. Spring often has us in a pursuit for clarity. 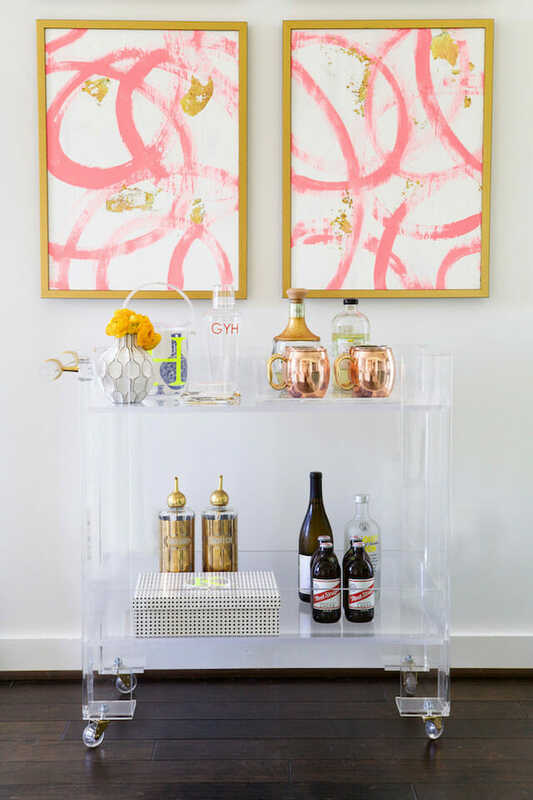 Interior design comes in no clearer form than with little (or large) touches of Lucite. Just when clarity felt simple, complexity is back. Suddenly the seemingly invisible become anchor points and pieces of focus in a space. Replacing color and playing with light, the invisible material has a magical touch. Stackable and sophisticated, the Ghost Chair by Philip Stark ghosts itself in many settings. A medallion back gives it a baroque flare. Include throw pillows to reduce its translucency or let the eye soar straight through by placing them against a vibrant backdrop . Lucite has a lofting effect when legs and stands are dressed in transparency. Visually heightening, Lucite is always an option for chair legs or casters, console and armoire stands, or floor and table lamps. The Lucite Palm Beach Dining Table at Wayfair offers an eight foot plane of transparency to a dining space. 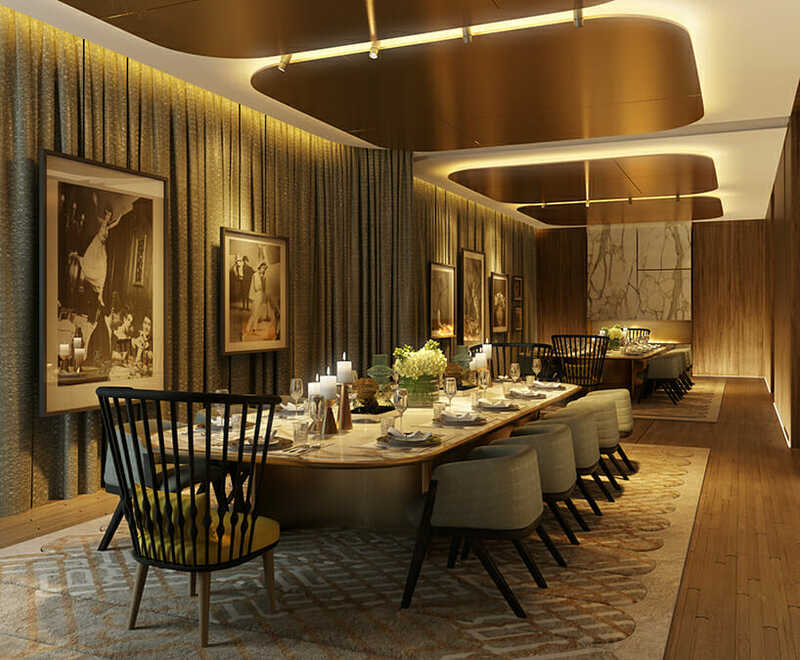 Layering patterns above or below the table creates a mesmerizing composition for dining design. 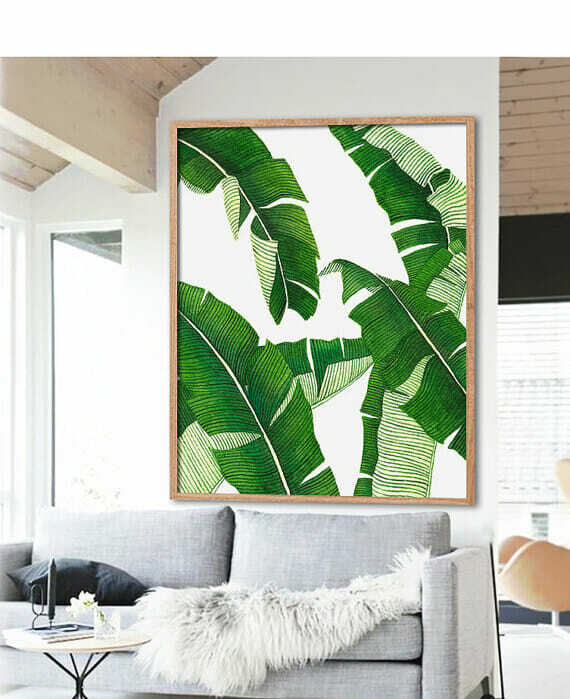 Whether you choose a subtle or bold application, there are plenty of ways to incorporate a little ‘Tropical’ decor into your home to create a fresh, modern and welcoming space. Accessorizing rooms with limited natural light or a dimly lit hall will quickly integrate your entire home with the outdoors. Tame the Mardi Gras grandeur down by adding accents with tropically inspired prints. 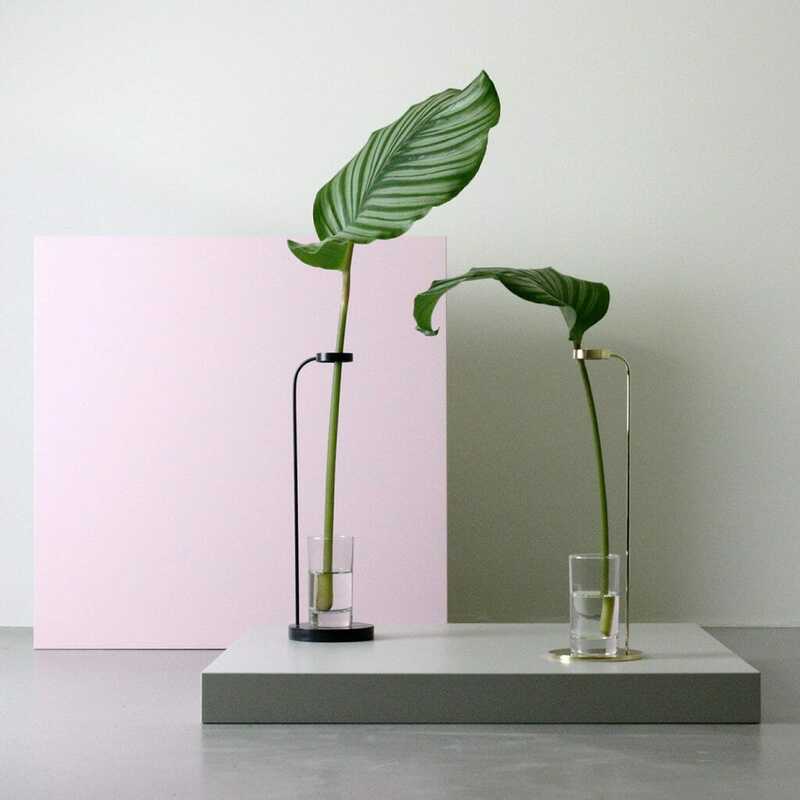 Keep things minimal with the STEM vase by Dubokk for Leibal. Start with a banana leaf and then show off each season with new stems and flora. 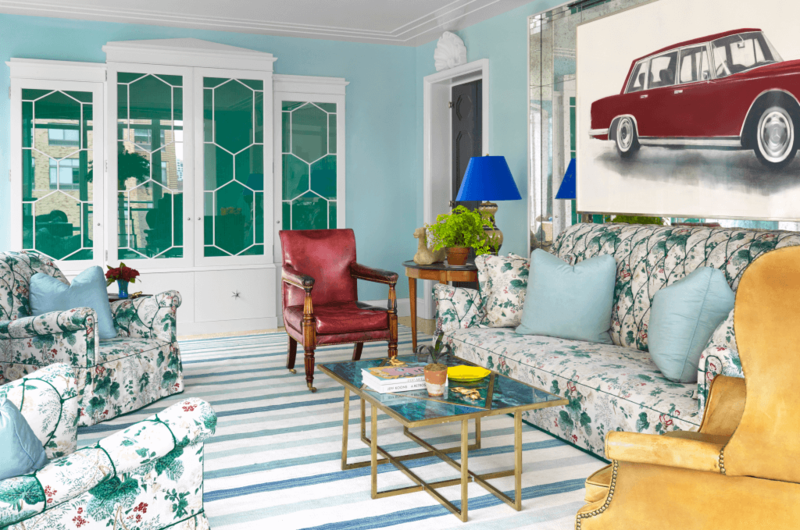 Incorporating one or all of these spring interior design trends will give your space the refreshed look of a new season! Needing a little guidance? 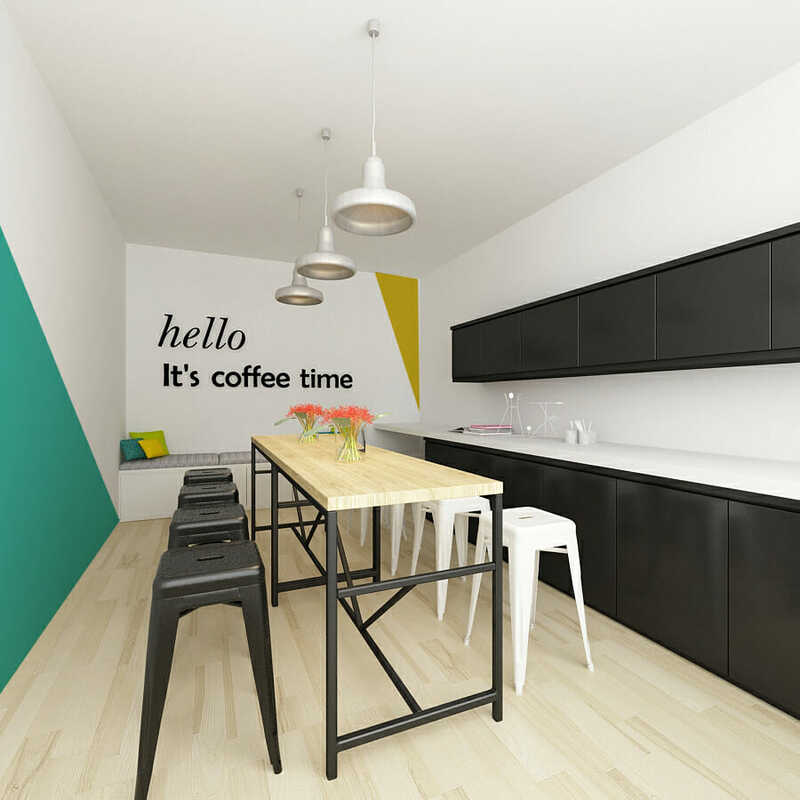 Start a Project today and let a Decorilla designer help revamp your design in a natural and appealing way! Written by Decorilla designer, Devin S.
Get Our Free Inside Scoop! Contains our handpicked top five posts on latest decor trends & advice delivered to you monthly!